From The House that Mouse Built: Hungry Musetta, intent on the stolen cheese, is unaware of the danger lurking on a weathered baby shoe. Artist Maggie Rudy ’80 creates a whiskered world resplendent with rodents. Creator Maggie Rudy, surrounded by book sets in her studio, helps Musetta hang up the laundry with clothespins made from toothpicks. The mice are everywhere in Maggie Rudy’s Mouseland, an attic studio situated in the hills of Northwest Portland, far above the city grid. One dons a paint-spattered apron and completes the portrait of a lady mouse dressed in vivid red. Two check the progress of a bean-sized loaf of bread baking in an oven. Three unpack a picnic lunch on a wind-swept field of green sweater grass. Four gather for a visit with Granny in her wee gourd house. Five submerge in a teacup, luxuriating in a steamy bath of cotton batting. They are sleek and flexible creatures, with gray-brown coats, soft white bellies, and pink noses. Their hands grasp. Their tails twist and bend. Their eyes reflect light in an uncanny way. They laugh, they dance, they pine for love, they pluck tiny guitar strings, and read penny-sized books, painted with a three-hair brush. 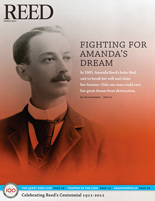 Maggie’s fascination with mice began in the third grade, when her family moved to Lancaster, England, where her father, a biologist, had a two-year postdoctoral fellowship in physiology. She awoke from her “baby stupor” to an English aesthetic that would remain hugely influential in her life: hedgerows, gypsy carts, and a field trip to the home of Beatrix Potter. From a shop in Lancaster, the Rudy household acquired some mice made of felt. She and sisters Susy ’79 and Annie dressed them and placed them in a variety of settings. The “rapture of the tiny” that she celebrated in childhood has never left her. After graduating with a degree in art from Reed, Maggie experimented with other media and continued her studies in the field. 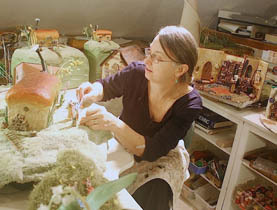 She saw the work of EJ Taylor at the Brandywine River Museum in Pennsylvania and was inspired to make dolls. For a few years, she made commissioned portrait dolls with fired clay and Sculpey clay. She is also an accomplished artist whose paintings and drawings are represented by the Mark Woolley Gallery. Along the way, she married Richard Alden ’75, raised two sons, Sam and Toby, and kept her creativity percolating as a volunteer at their school, the Arbor School of Arts & Sciences in Tualatin, Oregon, where she made puppets, costumes, and stage settings for the school’s annual theatre productions—some of her puppets are on permanent display in Arbor’s library. About 16 years ago, Maggie recalled the Lancaster mice, and wondered if she could design a creature that was more lifelike. With characteristic ingenuity, she set to work, experimenting with felt, paint, pipe cleaners, and little black beads. The result was a mouse, uniquely hers, requiring six or seven hours of concentrated time to make. “I have to be having a good day to make them,” she says. 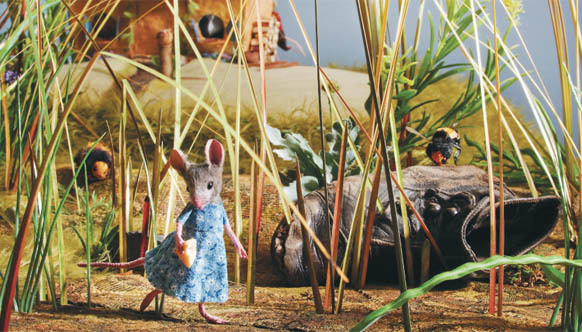 So far, she has made over 600 mice—many enjoying life in the fantastic and timeless settings she creates for them, while others are protected from the dust, sealed in canning jars like bewhiskered preserves, and awaiting a turn at the fun. It is the animate quality of the mice that instantly attracts the viewer; they are centered; they are affected by gravity. Maggie traces that movement back to a class given by Reed dance instructor Pat Wong [1975–2009]—the hardest class she took at the college, she says, and where she learned about gesture and how to embody movement. She also recalls classes taken from art historian Peter Parshall [1971–2000]. For her forthcoming book, The House that Mouse Built, Maggie created a judge’s chamber inspired by the interior settings that Parshall presented in his Northern European Renaissance class and from portraits of Erasmus in his study. In the mouse chamber, light pours in through a leaded window onto the desk, behind which a white-wigged judge officiates at a marriage. An inkwell and quill sit in readiness. Parchment scrolls and weathered tomes line the bookshelves, where the blind mouse of justice perches on a sewing bobbin. The room is replete with a portrait, a floor tapestry, an arched wooden cigar-box door, and—this is Portland, after all—an upturned umbrella in an urn. Maggie’s mice have gained a loyal following on the internet, thanks to her blog MousesHouses, and she hopes interest will continue to grow with the publication of her book. Working with the mice already has generated remarkable energy—enough to push Maggie out of the burrow and into the limelight. The House that Mouse Built. Downtown Bookworks, 2011.